On river left, I see it the way Telly saw it – a towering, polished slab where Idaho batholith and metamorphic gneiss collide. My hands grip my oars tighter, I shift on my seat. It can only mean one thing: Redside Rapid. Midsummer, on day five of a Middle Fork of the Salmon rafting trip, the river begins to change. I can feel it in the way the boat handles under me. 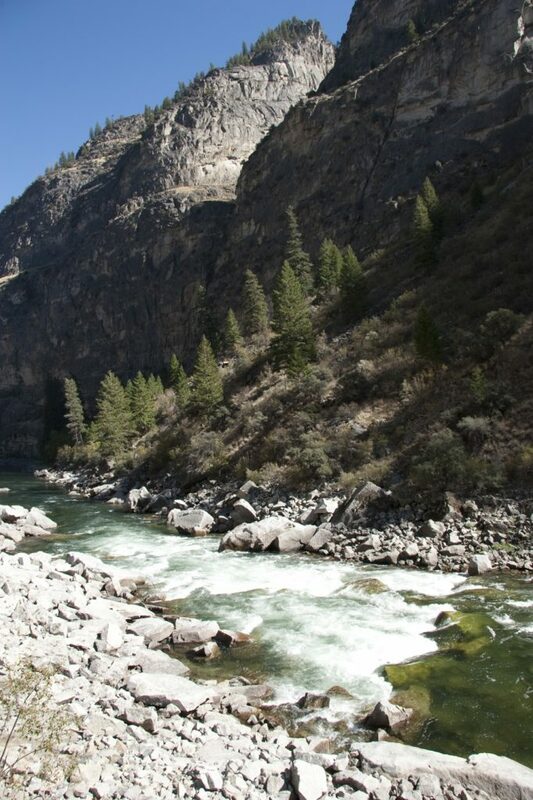 The Middle Fork of the Salmon River at Boundary Creek is small-volume, technical and continuous. By river mile 80, the river has begun to collect in languid, lazy eddies, punctuated by sharp drops with large waves. The granite walls around me rise. 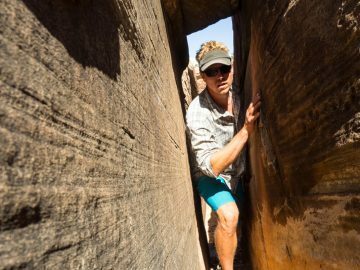 “Impassable Canyon,” the guides whisper to their guests. Not because it’s impassable by boat, but because once, when foot travel was the primary mode of travel in this country, there was no trail here. But maybe your guides don’t always tell you that, because a little suspense never hurts on the second-to-last day of a river trip. Redside Rapid is formed from the debris pushed into the river by Golden Creek, which enters river left. 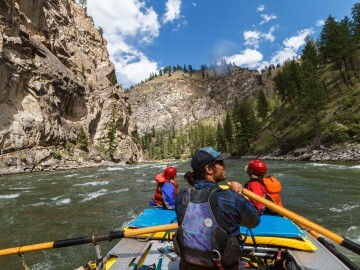 At medium flows, I position my boat on river right then navigate to the left, avoiding the wrap rocks that create giant, churning holes at higher water. Redside is always a signal to reel in fishing rods and find a way to hang on—Weber, one of the largest rapids on the river, is waiting below. In my experience, Redside Rapid hasn’t yet been the site of a big misadventure, although the stories of Sevy’s Rock and flipped boats are abundant. To me, Redside, nestled deep in the heart of Idaho’s Middle Fork country, means something else entirely. Telly Evans was a longtime Middle Fork river guide. Those who knew him say Redside Rapid was one of his favorites. When he took his life in 2010, his community came together and asked, “What could we have done?” The Redside Foundation, a 501(c)(3) nonprofit, was their answer. Today, as Director of the Redside Foundation, I probably type the word Redside fifty times per day on e-mails, donation acknowledgments, press releases and outreach materials. Just like all of us, I sometimes forget the heart behind my work. I get wrapped up in e-mail or to-do lists. I forget the stories of Telly’s laugh. I forget the way that Golden Creek, just a half-mile from the main corridor, cascades over a granite lip to form a beautiful waterfall. I forget how it feels to poise your boat in the green locomotive tongue above a rapid and then pull left with everything your arms have. I print the Redside Foundation logo again and again, forgetting that it represents my favorite view of the whole canyon. Luckily, working for a guide support organization, it’s part of the job description to remind myself of these things. Each summer, I still guide a few Middle Fork trips. 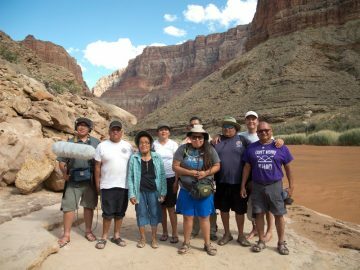 And every time I see that canyon wall rising on river left, I think not so much of the whitewater below but of the river community. I think of the thousands of guides and guests, famous and not, who have cursed and swam and laughed and shared shouts of congratulations through these Impassable Canyon rapids. To me, that polished wall, viewed from the long straightaway upstream, reminds me to be grateful for my people. 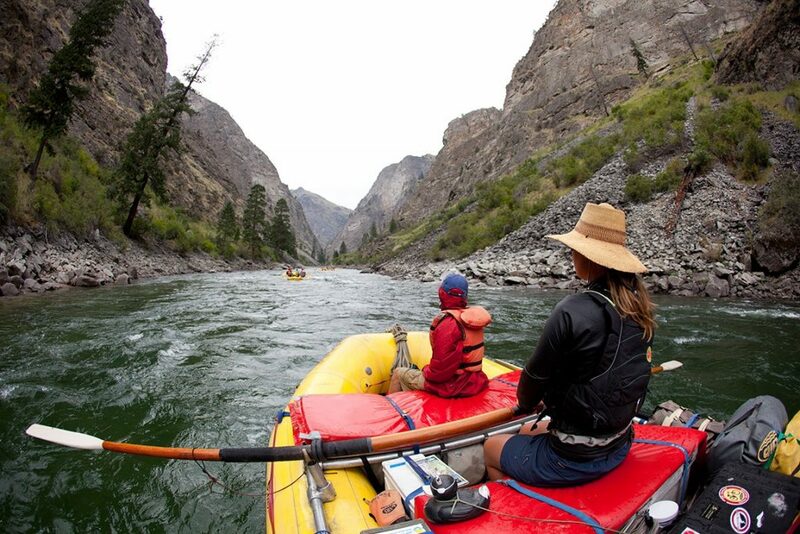 Anyone who has taken a river trip knows that the friendships are often as memorable as the canyon walls. In those quiet moments before the sound of clear, green water flowing over rocks drowns out my voice, I tell my guests about Telly Evans. I tell them about the lives, hopes, dreams and heartache that sometimes hide behind the smiling faces of their guides. And then we drop into the green and gray granite room of Redside Rapid. 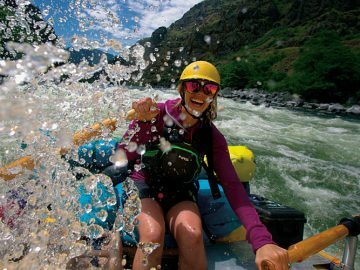 Emerald LaFortune is a guide for OARS Dories Idaho and the Executive Director for the Redside Foundation, a non-profit dedicated to supporting the health and strength of the Idaho guiding community.